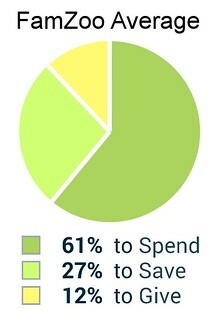 How much should be set aside each time for saving and giving? That’s entirely up to you. Every family’s situation and values are unique. Do what makes sense in your family. What do we do in my family? I like to have that discussion with each child individually. How much do they think they should set aside? Why? As long as it’s north of zero and there’s some thought behind the answers, anything is fair game in my book. They can also choose different allocations for different sources of income. Maybe set more aside from allowance, but less from birthday money. Nothing is set in stone either. Revisit the conversation over the years. Kids change their point of view as they gain perspective through financial and philanthropic experiences. They may wish to adjust their allocations accordingly over time. We were delighted to find that the average split percentages are more aggressively tilted toward saving and giving than our default settings of 80/10/10. 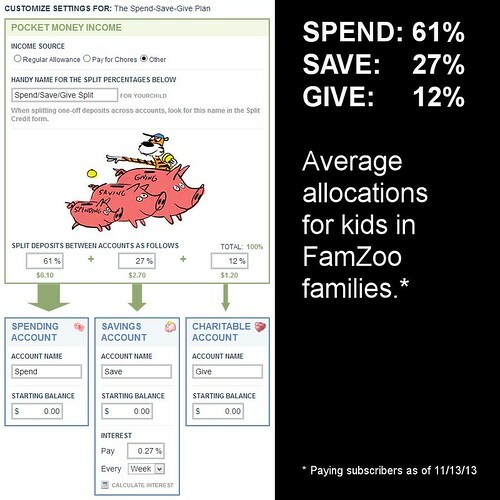 Kudos to FamZoo families!